Runner Brandon Belt was ruled out for failing to retouch a base based on the interpretation for passing a base, and specifically, the question of, "when is a runner said to have passed a base?" Belt runs past second base on his way to first. With one out and one on (R1) in the top of the 7th inning of Saturday's Giants-Pirates game, Giants batter Brandon Crawford hit a 0-1 slider from Pirates pitcher Tony Watson in the air to center fielder Andrew McCutchen, who caught the fly ball as Giants baserunner R1 Belt arrived at second base as part of a hit-and-run or stolen base attempt. As McCutchen completed his catch, Belt raced back to first base ahead of the throw, while Pirates shortstop Max Moroff called for the ball, claiming that in retreating to first base, Belt failed to retouch second base in violation of Official Baseball Rule 5.06(b)(1), which states, "In advancing, a runner shall touch first, second, third and home base in order. If forced to return, he shall retouch all bases in reverse order, unless the ball is dead." After 2B Umpire Dan Iassogna ruled Belt safe on appeal, Pittsburgh filed a challenge and Iassogna's call was overturned via Replay Review, Belt ruled out at second base for having failed to fulfill his OBR 5.06(b)(1) responsibility. Related (More about 5.06): Rare Real-Time Appeal Retires Runner over Retouch Rule (6/15/17). 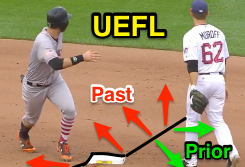 With replays indicating Belt kept a foot on the second base bag before beginning his sprint back toward first base, the question, naturally, is when is a runner considered to have passed a base, and when is a runner considered to have legally retouched it? A runner is considered to have passed a base if he has both feet on the ground beyond the back edge of the base or beyond the edge of the base in the direction to which he is advancing. Interpretations Diagram: Past vs Prior. Insofar as a play at second base is concerned, a runner has passed the base when both feet are on the left field side of the imaginary line that extends from home plate, through second base, and into center field (with the second base bag itself considered as part of the "not past" side of the field). 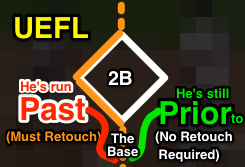 The accompanying "past or prior" diagram is the accepted interpretation for all situations where a determination is to be made as to whether a runner has passed a base, such as base award plays (e.g., Type B Obstruction or a forced-to-advance play [e.g., a walk]) or scoring decisions. *Grammatical note: "Past" is used as a preposition, part of the phrasal "run past" verb, as in, "he ran past the base." The past tense verb is "passed," as in, "he passed the base." Gibson observes the race to first base. EXCEPTIONS: On June 29, umpires ruled Diamondbacks batter Eric Fryer out at first base after he overran the bag without touching it and Diamondbacks first baseman Paul Goldschmidt was able to tag first base with his glove before Fryer returned to touch the base. 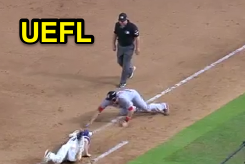 Fryer had initially missed his touch of first base in trying to avoid Goldschmidt, who himself had missed his tag—1B Umpire Greg Gibson thus ruled Fryer "safe" (the mechanically correct thing to do). The relevant MLBUM interpretation states that, "A runner does not acquire the right to an unoccupied base on an attempt to retire the runner until he touches it before he is put out." In 2016, first baseman Hanley Ramirez tagged batter-runner Nelson Cruz, who similarly missed first base during a tag avoidance maneuver, affirmed as a real-time appeal out by 1B Umpire Hunter Wendelstedt. Another exception is home plate, as there is no base past home plate which the runner may advance: a runner never truly "passes" home plate—he just forfeits the right to retouch it upon entry into the dugout. If both the fielder and runner miss their touches (the fielder misses his tag of the runner, and the runner misses home plate), no signal shall be given and no appeal permitted (for the aforementioned "a runner never truly 'passes' home plate" reason); the fielder must tag the runner to retire him (unless the runner begins to exit the field, in which case, an appeal is authorized in order to eliminate a "catcher chasing the runner" situation). This doesn't apply, naturally, to a force play, where simply tagging home plate will retire the runner.